Dramatic, red peony. Red Charm look-alike with a sweet smell. Diana Parks is a beautiful red peony with big, dramatic flowers. She can also be recognized by her rose shape and fragrance. Early in the season she is at her best. 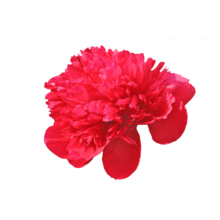 This peony and Red Charm share quite a few similarities. No wonder they get compared often. Unfortunately, most of the time Diana Parks gets underestimated. In contrary to the well liked Red Charm, this flower is fragrant: she leaves a pleasant smell. That’s exactly the reason why we think Diana Parks should receive as much appreciation as her ‘sister’. Diana Parks is a direct descendant of the Paeonia officinalis. Her origin is the main reason why many of her characteristics match those of her mother. They share the same color, both open up and drop their petals quite fast. This peony was discovered in 1942 by Bockstoce. He also registered her at the APS.